↑ Bourdain, Anthony (2001). A Cook's Tour: Global Adventures in Extreme Cuisines. New York, NY: Ecco. ISBN 0-06-001278-1. ↑ Baker, Aryn (2007-06-14). 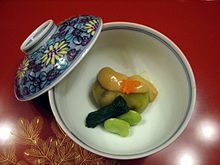 00.html "Kaiseki: Perfection On a Plate" Check |url= value (help). Time. สืบค้นเมื่อ 2007-07-17. ↑ Murata, Yoshihiro; Kuma, Masashi; Adrià, Ferran (2006). Kaiseki: the exquisite cuisine of Kyoto's Kikunoi Restaurant. Kodansha International. p. 13. ISBN 4-7700-3022-3. Murata, Yoshihiro. Kaiseki: The Exquisite Cuisine of Kyoto's Kikunoi Restaurant. New York: Kodansha International, 2006. IBN 4770030223. Tsutsui, Hiroichi. "From kaiseki 会席 to kaiseki 懐石: The Development of Formal Tea Cuisine" in Chanoyu Quarterly no. 50 (Urasenke Foundation, 1987). Tsuji, Kaichi. Kaiseki: Zen Tastes in Japanese Cooking. Kodansha International, 1972; second printing, 1981. หน้านี้แก้ไขล่าสุดเมื่อวันที่ 1 พฤษภาคม 2561 เวลา 20:30 น.